If you happened to read last week’s post chronicling my recent banana cupcake debacle, you can imagine how incredibly stressed I became when forced to shift gears under a time crunch, and come up with a quick and easy (yet still enticing, delicious, and somewhat impressive) substitute to bake for the very meaningful fund raising event I was contributing to. 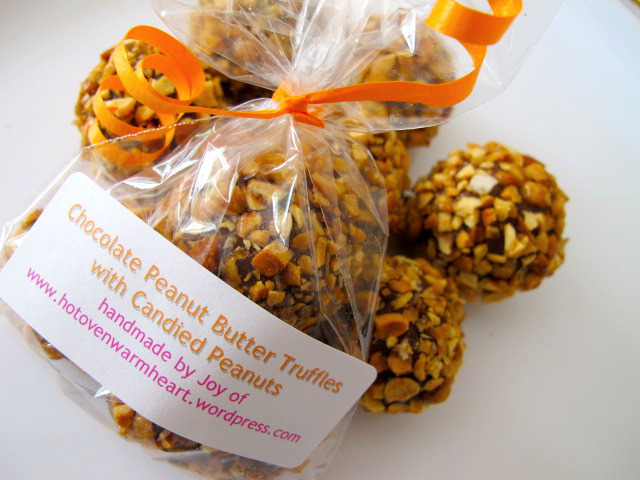 Thankfully, I could look no further than this week’s yummy SMS recipe, Peanut Butter Truffles, selected by one of our newer members, the highly talented and super creative Mara of Love Your Mother. Judging from the Hazelnut Truffles we made from the Sweet Melissa Baking Book last summer, I had a feeling that they would be similarly simple to assemble, but also rich, flavorful and unique enough for the bake sale. I am pleased to report that the truffles saved the day, and exceeded all expectations. 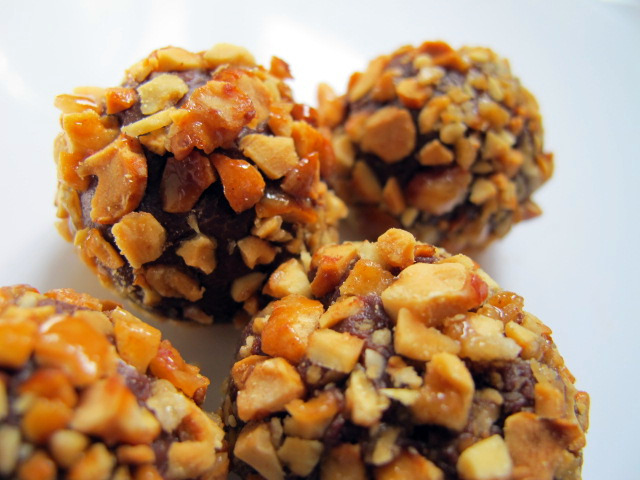 Of course, I couldn’t help but complicate matters by adding extra steps to the project- but really, who could turn down a truffle dressed up with a caramelized candied peanut exterior? I called on David Lebovitz’s recipe (used to top my Black-Bottom Peanut Butter Mousse Pie with Pralined Peanuts), which never disappoints, and the added sweetness of his chopped nuts was the perfect counter-balance to the slightly bitter dark chocolate and salty peanut butter. That little bit of additional effort resulted in a combination that truly danced on the tongue! A few special touches with the packaging- some cellophane goody bags, colorful labels, and orange ribbon (more on the significance of that detail later)- and viola!, my truffles were ready for their debut at the 1st annual National Food Bloggers Bake Sale! Did you know that nearly 1 in 4 children in America struggle with hunger? That’s almost 17 million kids! With the weakened economy, poverty rates are on the rise, and every day, more and more children wonder where their next meal will come from. * Enroll more eligible kids in school breakfast, after-school snacks and meals, and their families in SNAP (food stamps). * Bring community gardens and farmers markets to low-income neighborhoods. * Bring affordable, fresh fruits and vegetables to urban corner stores. * Teach at-risk families how to plan, shop for, and prepare healthy, low-cost meals at home. * Help local food pantries, food banks and soup kitchens meet the pressing demand for more nutritious food. * Increase awareness and understanding of childhood hunger and solutions to it. Since 2003, more than 1.7 million people have participated in Share Our Strength’s Great American Bake Sale, raising $6 million to make sure no child in America grows up hungry. But the big news? 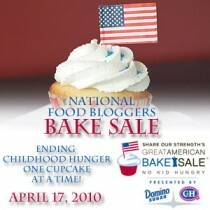 The first annual National Food Bloggers Bake Sale alone raised a grand total of over $16,500! Wow! 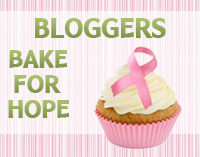 Go baking bloggers! I felt truly honored to be a part of it, and am already looking forward to next year. I want to say a big thank you to Gaby of What’s Gaby Cooking for coordinating the entire event, and Kathy-Ann for leading us here in Massachusetts. Also- shout out to my new friend Carmen of Baking is my Zen, who just so happens to be a fellow SMSter! Her sale in NJ did amazing, raising more than $600- fabulous job Carmen! To see pictures from our sale in MA (including some of my goodies- the Peanut Butter Truffles and a selection of Coconut Jam Thumbprints made with 5 different types of homemade jams/preserves) check out this slide show. For more information about Share our Strength and to find out ways you can help, visit their website, http://www.strength.org/. And don’t forget to check out the myriad of truffles whipped up by the other lovely ladies of SMS by exploring the blogroll! Oh, by the way, the orange ribbon stands for hunger awareness… fitting right? 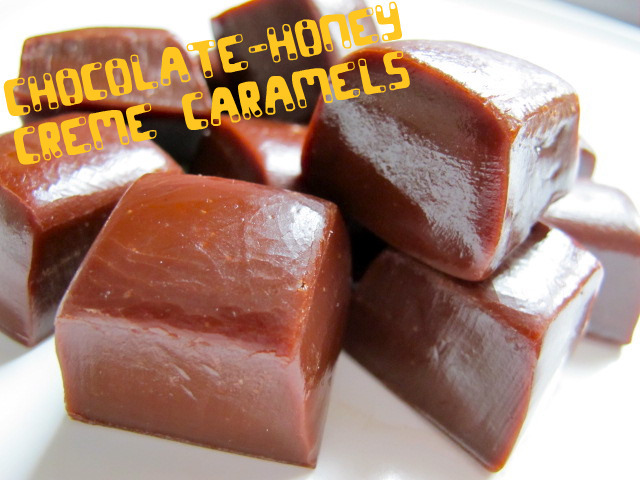 So we’re off and running with a brand New Year of Sweet Melissa Sundays, and I’m so pleased to start with a recipe chosen by my adorable and hilarious friend Jeannette of The Whimsical Cupcake: Chocolate-Honey Creme Caramels. 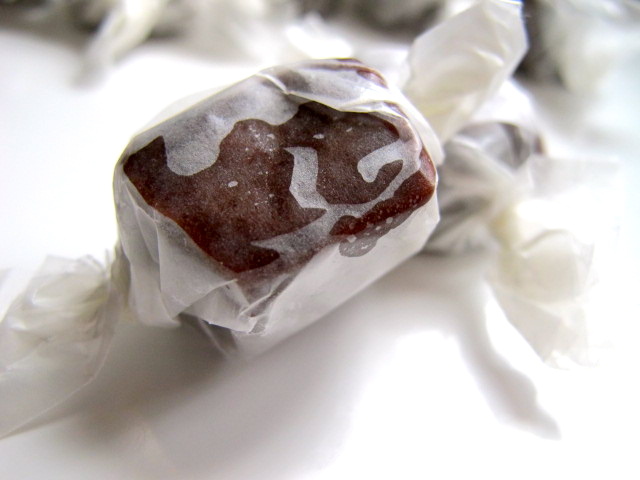 Though I didn’t realize SMS was back in action until the last minute, I was able to whip up a batch of these gooey-chewy candies with ingredients I luckily had on hand. And bonus!- I got to use my new handy-dandy digital thermometer. After I nearly scolded myself trying to take the temperature of boiling-hot, bubbling red raspberry jam (the probe on my old-school thermometer wasn’t long enough to reach when attached to the side of the pot), I decided that with plans to pursue future jam and candy making ventures, I needed to outfit my kitchen with the proper hardware. Of course, I did some online research, reading a slew of reviews, and finally settled on this model, which I found, no problem, at the local Le Gourmet Chef. Does anyone else feel dangerous walking into one of those stores? I feel like I’m rendered powerless when faced with aisles chock full of tempting cooking and baking gadgets, shiny pans of every shape and size, and cutesie kitchen gear that I certainly don’t need, but just can’t live without. Maybe it’s just me. This time I made it out alive with just the thermometer. And a cookie scoop. C’mon, I didn’t have that size! All in all I’d say I was pretty good. Thankfully, I was on a mission. I had to go home and get caramel-izing. Since my past experience with caramel has been touch-and-go, my heart began beating faster when I read that we’d be exploring it again. But I trust Jeannette, so I was off to the stove! One thing I thought was very interesting, was that nearly all the ingredients were combined at the beginning, and you basically just stir and wait for the mixture to come up to temperature (which, by the way, took between 20-25 minutes!). This recipe called for the syrup to reach the “firm-ball stage,” specifically 248 degrees F. I discovered a wealth of information on baking911.com about the different temperature stages used in candy making- there’s a very helpful chart that demystifies the terminology- and learned that “firm-ball” indicates a final product that is malleable and will flatten when squeezed. With that in mind, I was happy to find my block of set-up caramel exhibited the characteristic description. After completing the sticky business of cutting into 64 bite-size squares, I offered my Mom a taste, and she hummed her usual “Mmmm!” Always a good sign. She loved the balance of rich chocolate and sweet honey, and thought the taste was exceptional, rivaling gourmet quality. While I didn’t win over my caramel-hating Dad- he too liked the taste, but couldn’t overlook the texture he typically dislikes- I considered these sweets a success, and I’m definitely looking forward to sharing… boy, once these little guys are all nice and cozy in their twisted wax paper wrappers and piled high, there’s really a mountain of ’em. A quarter or half batch probably would have been plenty for us, (I knew I should have followed Hanaâ’s lead!) But, I have a feeling they’ll still somehow end up disappearing! A BIG shout-out (and thank you) to my dear Jeannette– please head on over to her fabulous blog, The Whimsical Cupcake, for the recipe… not only will you see some mouth watering creations, but I guarantee she’ll put a smile on your face! 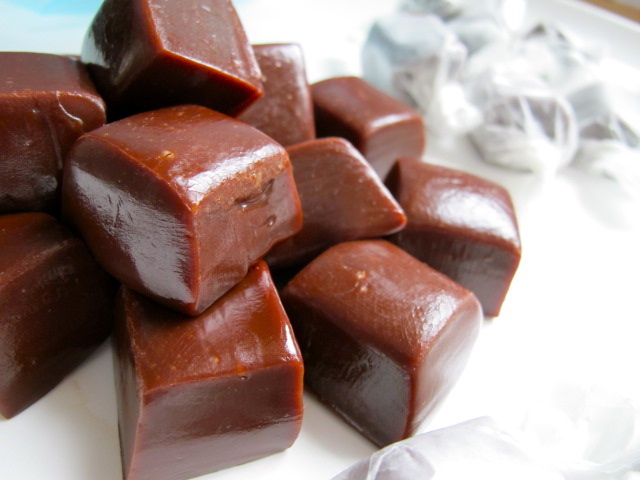 If you’re like me, and the thought of caramel making evokes your inner cowardly lion, give these relatively simple Chocolate-Honey Creme Caramels a shot, and let me know if you need a personal candy making cheerleader- I’ll absolutely be right there. 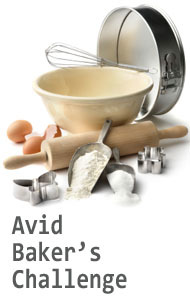 That’s what virtual baking buddies are all about! Do you ever wish life had a pause button? I might be overly influenced by my DVR, but I keep thinking how utterly advantageous a short intermission would be right now so I could have a chance to stop and catch my breath. The last few weeks have been a whirlwind of sickness, stress, and strain, and unfortunately the preoccupation precluded my participation in quite a few weeks of baking and blogging. Some of the baking did take place- it is probably the only thing that has kept me sane throughout- and I even snapped a few photos, but I just couldn’t seem to pull together an accompanying post in time. I can’t wait to share the results in an SMS recipe rewind of sorts- most notably featuring my first ever bread pudding made from Julia Child’s homemade brioche. I even made both the recommended raspberry sauce and a bonus decadent caramel sauce for my mom (the berry-allergic). Coming soon to “Hot Oven, Warm Heart.” But for now, I’m so pleased to get back into the swing of things with today’s assignment, Melissa Murphy’s Butter Toffee Crunch. Sort of. Now maybe it was my faulty cheapo thermometer that sprung a leak, or the remnants of dear old Ida, who came barreling into town full force yesterday (I read that humidity/ moisture level in the air can negatively effect the candy making process), or maybe I made a irreparable error along the way (I am a novice at this after all), but the Butter Toffee Crunch was a colossal disaster. The one thing you want to avoid when making candy is the sugar crystallizing, and despite my careful adherence to the directions, that is precisely what happened. I knew as I was pouring the gloppy, bubbling caramel on the baking sheet that something went horribly awry, so I wasn’t too surprised to find a crumbly mess upon attempting the final step of breaking into pieces. The taste sadly solidified my fear that I now had 3 lbs of chocolate and nut covered brown sugar- cloyingly sweet and downright gritty. Now while I can’t pin point exactly which culprit was responsible, I’m a bit doubtful that the recipe would have been successful even if the stars were aligned. To me, the ratios seemed a bit off- especially when it came to the sugar- all 4¼ cups of it. Regardless of the toffee’s texture, the caramel layer was very thick (and I did use the largest rimmed sheet pan in my kitchen)- it was just way too much and made even a small piece overwhelming. The semisweet chocolate didn’t help matters, and without that bitter tang of dark chocolate, there was no contrast to balance the saccharine mixture underneath. By the time I realized that my afternoon of candy making was a flop, the sun had set, and I left my kitchen disappointed and demoralized (I know… I take these setbacks too personally… I’m working on it). As I laid in bed running through the steps over and over again in my head, and contemplating the overflowing container of no-good toffee on my counter that I didn’t have the heart to throw away, I hatched a plan for the next morning. I would not end my candy making career on a bad note- instead I would forge forward with a new recipe in hand, and give it another go. Luckily, I wouldn’t be disappointed. For toffee #2 I turned to a very reliable source when it comes to the sweets department: David Lebovitz. It just so happened he posted a remarkably similar recipe (same idea, but very different proportions) that I thought might just do the trick. 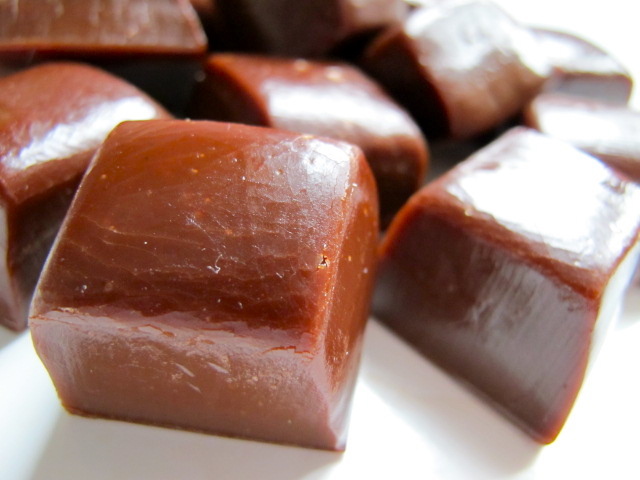 Following his instructions to the T produced a batch of the most delightful homemade toffee I could ever imagine. I had a much better feeling pouring the gorgeous dark amber colored caramel over my toasted almonds, and knew almost immediately it was okay when I watched it set up in a hard, almost translucent layer mere seconds later. As I sprinkled my Ghiradelli bittersweet chips on top, spread them into a shining melty sheet of chocolatey goodness, and distributed the remaining toasted chopped almonds across the surface, I couldn’t help but have a smile on my face. I didn’t say anything to my mom in fear of giving myself a kena-horah (Yiddish for jinxing), but I was hopeful that first bite would confirm my suspicion- this candy would not only be edible, it would be delicious. Both my parents proclaimed it far and away the winning candy, much improved from my initial attempt. A nice crunch yielded to a chewy treat with just the right amount sweetness and pronounced chocolate and almond flavors. 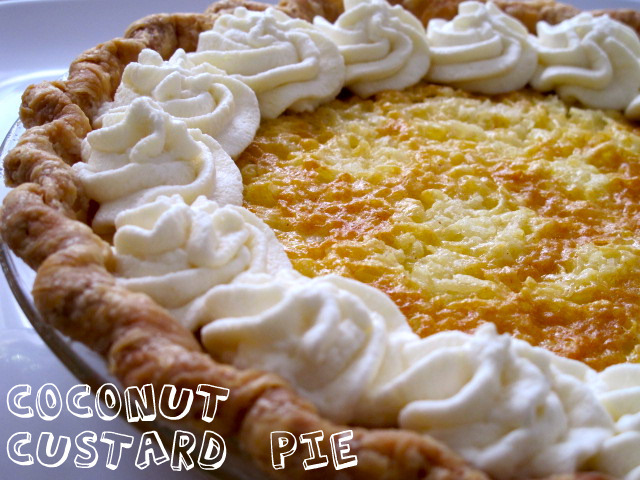 The simple list of ingredients came together in perfect harmony, producing an indulgent delicacy with addictive properties. After offering pieces to both my mom and dad, I watch them each sneak another taste off the tray a few minutes later- always a good sign. 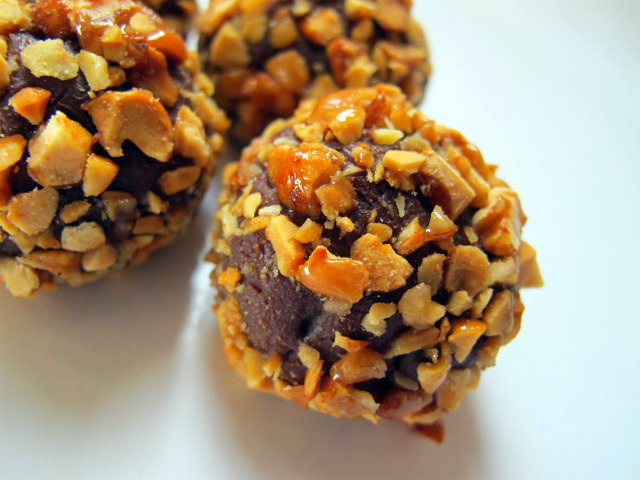 Though reminiscent of the caramel matzoh crunch I make every year at Passover (I will surely be sharing that this Spring), the Chocolate-Almond Buttercrunch Toffee is definitely a stand-out recipe in my repertoire that I will be calling upon for gift-giving this holiday season. 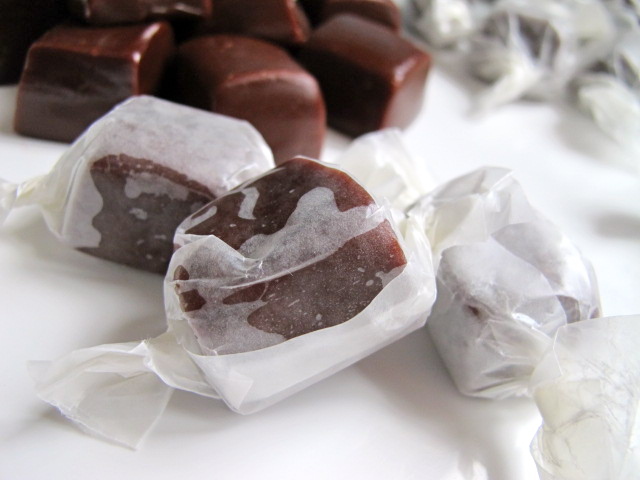 Great to have on hand to serve surprise guests who pop up this time of year (you probably have everything you need to make it in your pantry), it is a wholesome, quality sweet that is sure to impress. If you’re looking for a dependable recipe to use as an introduction to candy making, take my advice, and give David’s a try. You won’t be sorry! 2. Sprinkle half the nuts into a rectangle about 8″ x 10″ on the baking sheet. 3. In a medium heavy-duty saucepan fitted with a candy thermometer, heat the water, butter, salt, and both sugars. Cook, stirring as little as possible, until the thermometer reads 300° F degrees. 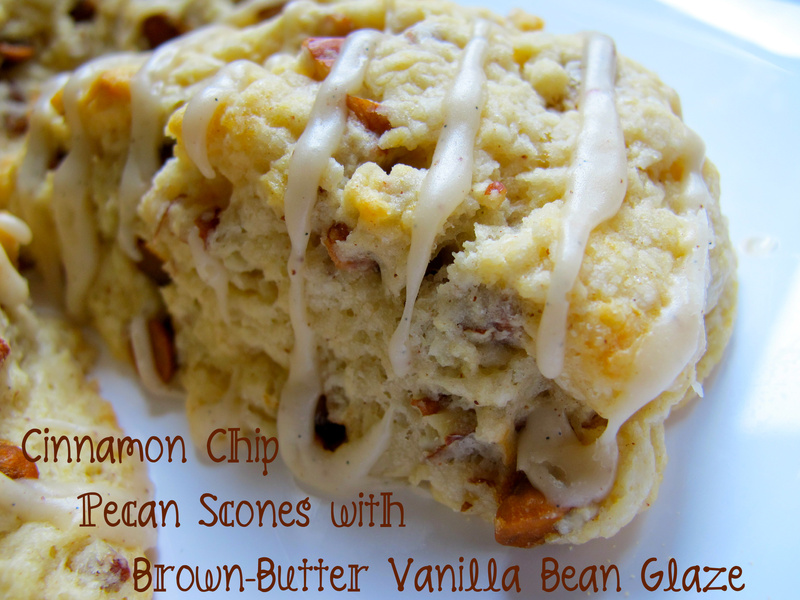 Have the vanilla and baking soda handy. 6. 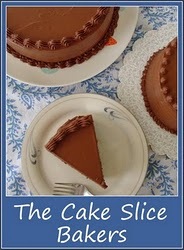 Strew the chocolate pieces over the top and let stand 2 minutes, then spread in an even layer. 7. If using, sprinkle with a small handful of cocoa nibs and a flurry of fleur des sel. Sprinkle the remaining nuts over the chocolate and gently press them in with your hands. 8. Cool completely (you can pop it in the fridge if you’re impatient, like me!) and break into pieces to serve. Store in an airtight container, for up to ten days. 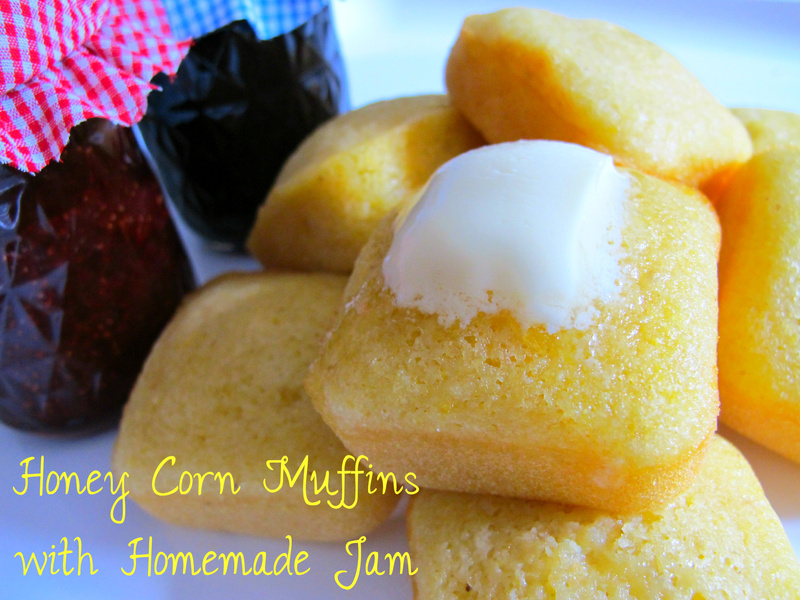 •	Before you begin, make sure to read the recipe thoroughly and gather all your ingredients so that they are ready to use- I measured mine out in advance (especially the baking soda and vanilla) so I could grab them at a moments notice when the syrup came up to temperature. I learned that the baking soda is what aids browning and gives the toffee a lighter texture, while the vanilla adds depth of flavor. •	Make sure your candy thermometer is accurate. If you’re unsure, a good trick is to bring a pot of water to a boil- it should read 212° F if you live at sea level. If you find it’s off a degree or two, simply adjust your recipe taking this into account. Also, the tip or bulb of the thermometer should rest above the bottom of the pan for a proper reading. 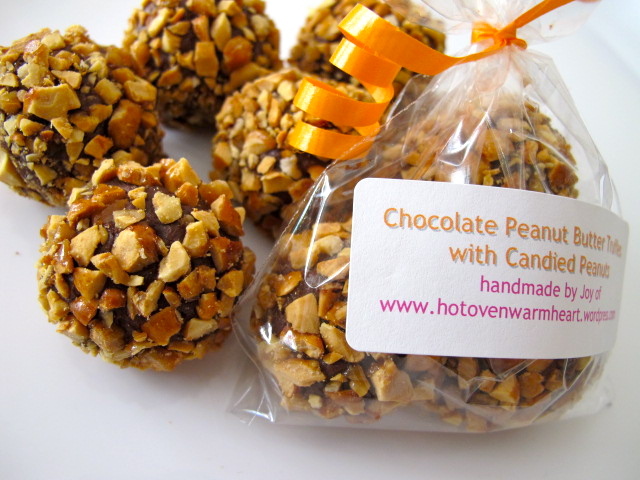 •	Use a heavy bottomed saucepan so the candy will not scorch under high temperatures. In addition, it’s recommended to use a long handled wooden spoon (as opposed to metal), because the sugar crystals are less likely to stick to the wood. •	Take extra precaution when handling hot syrups- just to be safe, it’s handy to keep a bowl of ice water on the counter which you can plunge your hand into immediately to stop a burn if an accident occurs. 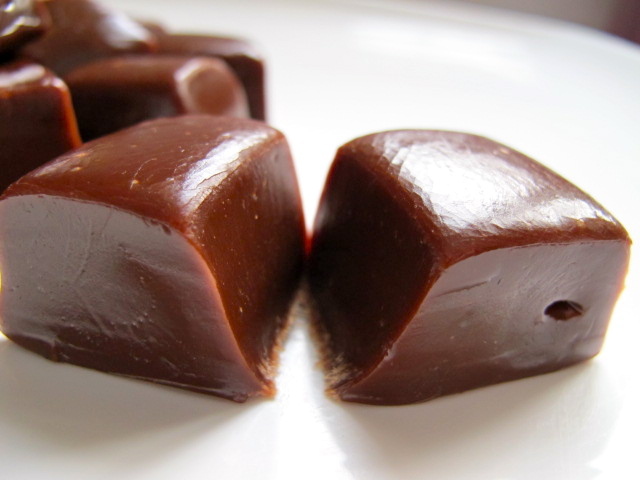 •	Avoid overstirring- it can overwork the caramel and result in the dreaded crystallization. 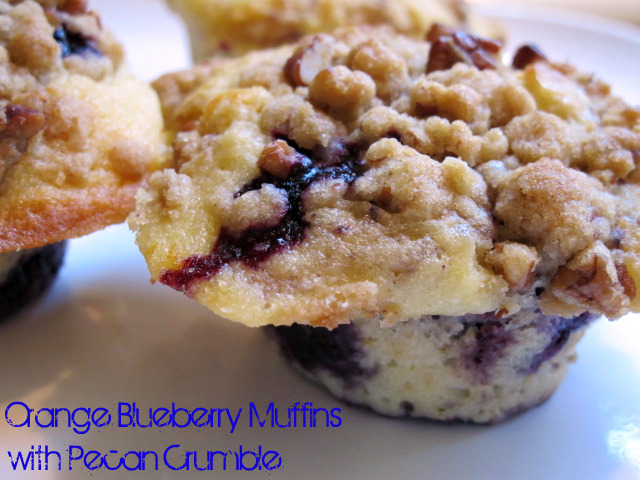 •	For easy clean up- after the pan cools, fill it with water and bring to a boil. Let stand until the syrup melts away. 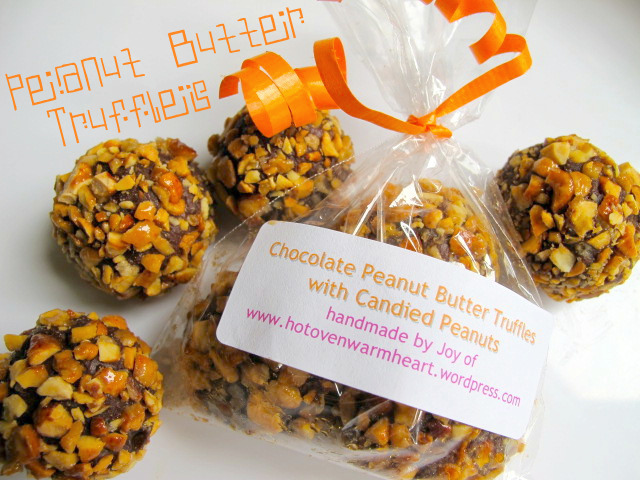 •	Buttercrunch Toffee will keep for about 7-10 days- store it in an airtight container to prevent softening. •	Most importantly, please keep in mind that every once in a while, candy doesn’t work. It may be too humid, or the sugar decides to crystallize (as in my case), or it’s just not your day. Try your best not to get discouraged; according to David, it happens even to seasoned professionals. 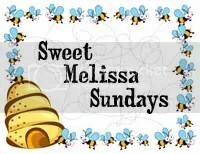 I can’t wait to visit all my fellow SMSers’ sites to find out if they had better luck with Melissa’s Butter Toffee Crunch (the recipe’s over at “Kait’s Plate”), and catch up with everyone through our comments- I’ve really missed all my lovely baking ladies! 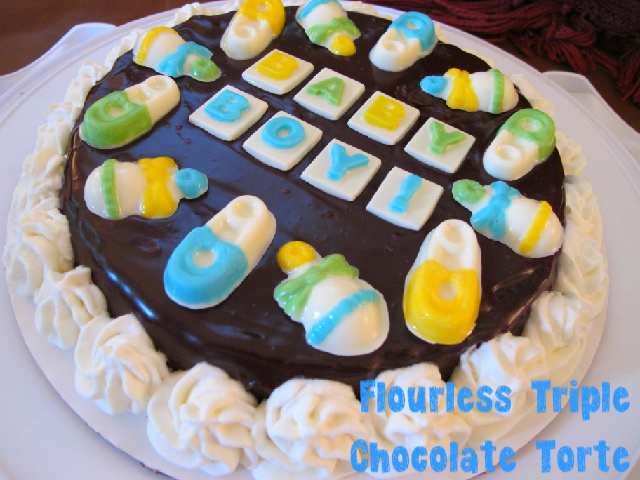 Check out the blogroll to see how each fared. Thanks Kait for your fun selection, and for pushing me into uncharted culinary territory!